"These twin terrorist explosions are part of a criminal plan aiming to plant the seeds of strife," says Hezbollah after Tripoli attacks. Hezbollah condemned on Friday the explosions in the northern city of Tripoli, saying the attacks seek to divide the region by inciting sectarian clashes. 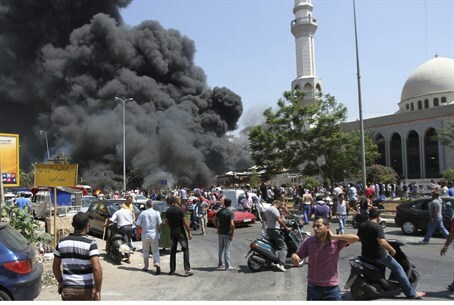 "These twin terrorist explosions are part of a criminal plan aiming to plant the seeds of strife between Lebanese and drag them into fighting under the banner of confessionalism and sectarianism,” Hezbollah said in a statement quoted by the Lebanese Daily Star. “[This] in turn serve pernicious international designs to divide the region and drown in blood and fire,” the terror group said. “We voice solidarity with our brothers and people of Tripoli in these tragic times when innocent blood is being spilled with no reason,” the group said. Meanwhile, the death toll from the powerful car bombs which exploded outside two Sunni mosques has gone up to 42, the highest toll in an attack since Lebanon's 1975-1990 civil war, according to the AFP news agency. Earlier, the Lebanese Red Cross earlier said there were also at least 500 wounded, with director Georges Kettaneh adding that many of those hurt had serious burns and head wounds. The first bomb struck in the city centre at the Al-Salam mosque as worshippers were still inside. The second explosion struck outside Al-Taqwa mosque near the port. The attacks in Tripoli come a week after a bombing in the Beirut bastion of Hezbollah, a close ally of Bashar Al-Assad, which killed 20 people. That attack was claimed by a previously-unknown Sunni Islamist group, who threatened more attacks in revenge for Hezbollah participation in the killing of Sunnis in Syria. The attacks also come one day after a leading supporter of Hezbollah was assassinated in Tripoli. The man, Hassan Al-Mouri, Al-Mouri was gunned down by "masked men on motorbikes," along with a security official and a bystander.